Beautiful, handmade three tiers Diaper cake! It can be used as a shower centerpiece or just to give as a gift, can also be used to welcome a new baby in the hospital room. This cake dissembles in seconds to stock the diaper stack on the changing table! 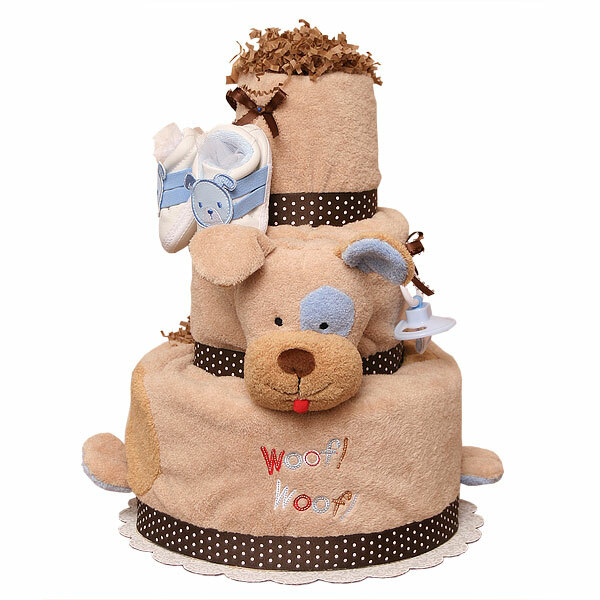 This cake made of 40-45 Huggies diapers size 1-2 (8-15 lbs.) and a cute Puppy Blanket (my snuggle Buddy) by Bright future; One flannel receiving blanket 100% Cotton; One baby crib shoes size Newborn by Carter's; one pacifier. Cake decorated with pins, ribbons and bows. The diapers are held together by ribbons no glue on diapers. Ribbons are hand-stitched with white embroidery floss on the back of the cake, allowing for a clean, handmade look.